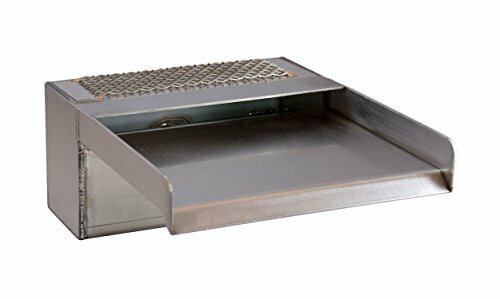 Zanardi 8" Open Top Waterfall Spillway Scupper for Water Features, Pools, Fountains - Stainless Steel (8") | Fountain City Art Ctr. Create a landscape environment like none other with the Zanardi Open Top Waterfall Spillway. The Zanardi boldly projects out of fountain and pool walls, giving great view of water peacefully traversing it's spillway and sheeting water effortlessly into the basin below. Made 100% from marine-grade stainless steel that has been treated with a military-spec chemical bath, the Zanardi open top waterfall spillway will give you years of enjoyment without structural concern. Zanardi open top waterfall spillways are built with a tank hidden into the wall, with proper baffling to provide a laminar flow of water sheeting for up to 3 feet into your basin.